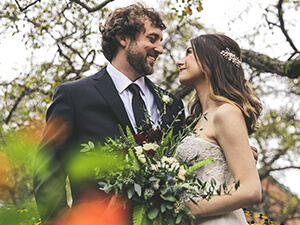 We're Galveston's number one limousine company specializing in luxury transportation services all over Texas for any event from birthdays to weddings to proms to nights on the town. We have top rated customer service, beautiful vehicles, and unbeatable prices. And one thing that we can guarantee you is that our service is the perfect compliment to what is available to see and do in the Galveston area. 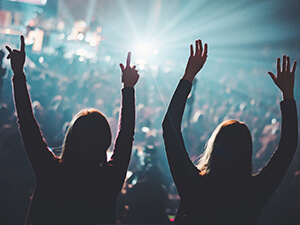 If you are going to have special plans to check out various locations in the area, you need to make sure that you look for a luxury entertainment transportation solution. That means us. We realize that you are going to have a very long list of destinations including places like Seawall Urban Park, Bishop's Palace, the Strand Historic District and Seawolf Park just to name a few. But these venues will be so much more enjoyable when you travel to them in one of our unbelievable vehicles. There are many travelers who think they can get away with carpooling. If that happens to be you, then we urge you to think again and consider the consequences. Think about it. If you choose to carpool, you will have to divide your group up into smaller groups which will all then squeeze themselves into indivdual vehicles. Because you will have to designate drivers, there will be some among you who will not have the chance to enjoy their favorite libations. Also, all of your vehicles will have to fight traffic and constantly be searching for parking spaces which will then allow you to all come together again for your next venue. And this same activity will have to be repeated again and again. This doesn't sound like a lot of fun to us. But if you decide to ride with us, consider the difference. Your group will be together for your entire experience. This is a huge plus. Once everyone is on board, it won't take long to see why they refer to our special vehicles as a party on wheels. Let's put it this way, the party will never end when you ride with us. And how could it with granite top bar areas with built-in coolers of ice, a premium sound system with subwoofers, multiple high definition flat screens with DVD capabilities, color changing party lighting, a special dancing floor with a dancing pole and luxurious wraparound seating which provides the perfect setting for catching up with friends. And all of the stress of driving will be left in the very capable hands of one of our drivers. You and your group will be dropped off near each venue you visit as well as picked up at the same place. Now you can see all of the advantages of going with us. Browse our site to learn more about our company, our fleet, and our policies. Call us any time to book your reservation, get a quote, or just ask questions. But for now, you are definitely in the right place. Peruse our website and learn as much as you possibly can. Pay particular attention to our fleet page where you can take a gander at pictures of our fabulous vehicles. Also, read over the frequently asked questions page, you might find that some of the questions that you have are answered there. As you are reading, make sure that you have a notepad and pen nearby so that you can jot any questions down that might come up. When you feel that you have learned all you can from our website, contact our customer service office. Our knowledgeable and very friendly customer service agents love talking about what we do and they will be able to answer your questions. One thing that we can promise you is that you will never be pressured into making any kind of decision. If all you want to do is talk about the possibilities, then that is fine with us. But when you do feel that you are ready to move to the next level, one of our specialists will be delighted to walk you through the easy and painless booking process. We hope you choose to ride with us. You truly do not want to miss this opportunity. Our representatives are available 24/7, 365 days a year for your convenience. We can't wait to hear from you. And more than that, we cannot wait to build a long lasting relationship with you. We have the most amazing vehicles! This is a great choice if you want to travel in absolute luxury! This bus has a beautiful interior and great custom features! 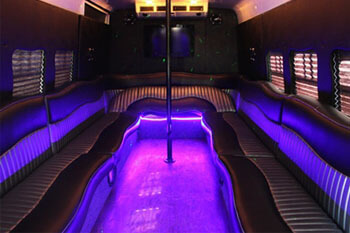 With custom club-like lighting, dance pole, and loud sound system make this bus a great choice for those who want to pary! If you have a larger group that wants to celebrate and travel in complete style, comfort, and luxury, then our F-650 is for you! Head on over to our events page for more details! 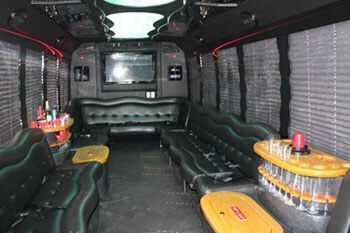 Party Bus Galveston specializes in amazing luxury service for any and all events! No matter what you're planning in beautiful Galveston add a little luxury into the mix with one of our beautiful limousines or buses! Our vehicles have the most amazing features and interiors to fit the needs of any event! You can count on Galveston Limos to always arrive on time and with your great chauffeur is appropriate attire. 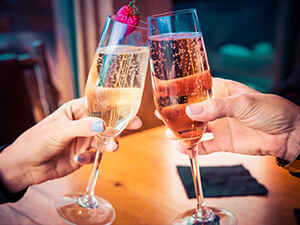 When you choose us, you'll spend your evening celebrating, the way you should, and not stressing over things like traffic and parking! Call us any time to book your reservation or head on over to our events page for more details! You get top-quality service when you choose us. You get the most amazing vehicles and service at unbeatable prices! We have the most beautiful vehicles with custom interiors and amazing features!